Three years ago I arrived in Ocean City to run my very first race of any kind, The Island to Island Ocean City Half Marathon… Yeah that is a mouthful to say. I was nervous and excited wondering what it would be like to cross the finish line of a half marathon. I didn’t conquer my first half alone. My friend John, who had run several Boston Marathons and has recently completed an Ironman, joined me and paced me. I remember vividly when I asked him how fast we were going he responded, “Are you going to win?”…. Oh course I responded “No.” He then said, “Are you going to finish?”…. Without hesitation I said, “yes!” and I sorta believe it. He then said something that has stuck with me ever since… “Then don’t worry about the time. Enjoy the race. It is your first.” He then proceed to distract me from the difficulty of running further than I had ever run at that point by telling stories, asking questions and keeping me laughing. It was amazing to log mile after mile. Running down streets and over bridges. I was conquering a goal set months before that seemed daunting and very difficult. My body was sore and wanted to stop, but my mind kept pushing forward and my friend was there to encourage, support and give me advice. We finished and I felt great. Ever since that day I thought that if I was going to return and do The Ocean City Half of better be something just as special as my first race. Fast forwarded three years. May 2015. A few months ago I was asked if I’d be interested in being a pacer for the Ocean City Half. “Of course!” I knew I could run steady at any pace over a two hour finish time. I was flexible and willing to run an pace. When the organizer of the pace groups sent me a message asking me to pace the 2:30 finish time I was ready. The goal of a pacer is to bring the group in within two minutes under the goal pace. This would mean I would be running a half marathon at roughly a 11’23” pace or nearly two and half minutes slower per mile than my normal pace for a 13.1 mile run, but this wasn’t about me. This was about helping others reach their time goals and for some finish their first half marathon. This was exciting. As I boarded the bus with the other pacers I could see people looking at my sign and wondering to themselves and sometimes out loud… “Should I run with him?” – I was more interested in sleeping since I had to get up at 4am to get to Ocean City and catch the 5:15am “run” bus to Assateague. The race didn’t start until 7am so I had some time to walk up to the beach. The sun was just rising and so I was not alone in taking in the beautiful beach scene and take a few pictures. I also took the time to hydrate knowing that my plan was to not stop at water stops until I built up a nice cushion of time for the pace group. And suddenly we were off. I have run lots half marathons. Most of them for fun with friends around town and most often for my own goals… But today was different. Today my time didn’t matter. My goal was to get this group following me over the finish line before two hour and thirty minutes flashed on the clock. 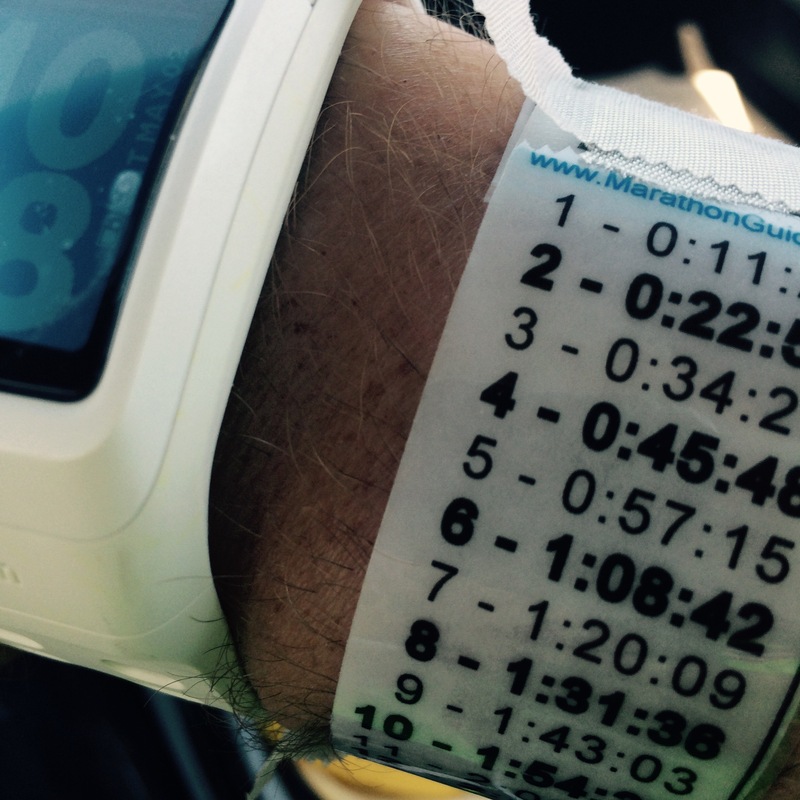 Ideally pacers should cross inside two minutes before their pace time – so in my case between 2:28 and 2:29:59. Distraction was my goal. If I distracted the people running with me they were less likely to worry about their pace, the mileage and most importantly how tired they are or how much pain they are feeling. So I told stories. I told jokes. And I asked questions. “Where are you from and why are you running this…” was my favorite question. I then called the person by their city or something that stuck out. Around me I had Pittsburgh, pink, Massachusetts, Philly, and Ravens. I emphasized that they should talk too much so they could focus on breathing and saving energy… So I talked away. I shared stories of running with random dogs, beach runs, night halfs, and of course my experience at my first half and how john gave me a Milky Way at mile 10 to give me an extra boost. “Hey you are going the wrong way!”, I yelled at a guy who was obviously running into the wood to relieve himself. “Stay with me Philly”… “Pittsburgh and girlfriend… Where are you?”. Truth is it was a first time pacing. I figure it all out the night before. Elapsed time was the key. All I had to do was compared the elapsed time to the time on my pace band when each mile flag appeared. Six miles in and we were two minutes under goal. The six people around me, counting on me were feeling good and looking strong. I constantly looked at my watch, the pace, the average pace, the elapsed time, and my running group. Mile 8. “Everyone! Be sure to get water. You need to hydrate and we are good on time. Grab a cup.” Baltimore was feeling the pain. Pink had stepped it up and was a quarter of a mile in front of us. Pittsburgh and his girlfriend were to my right and Philly was on my left. There were also a few people in front of us that kept looking back probably thinking “We can’t let 2:30 pass us”….. Ravens was one of those people now. Mile 10. “Do you ever drink during a run?” I was asked as we approached the water stop. I hadn’t noticed that I didn’t drink anything the entire first ten miles. It wasn’t too hot and I was focused on helping my group meet their time. It was more of a concern for Baltimore than it was for me. So at mile ten I became a social drinker and grabbed a Gatorade cup. There. I am hydrated. We crossed the bridge into Ocean City. I stressed the importance of breathing and not thinking of anything but moving those feet forward. I wasn’t leaving any of my core six runners now. Their eyes were focused foward. When I say “two” you say “30”… Yeah we yelled that. That last mile I changed from a story-telling jokester to a boot camp instructor. I wanted everyone to finish strong. I wanted everyone to meet their goal. Ravens in front of me next to Pink. Philly and Baltimore to my left and Pittsburgh and his girlfriend a few yards behind us. It was happening. We passed a lady who cursed pretty loudly at me… “What was that for” – I asked. “You weren’t suppose to pass me!”… “Then run with me and finish with us!” And she did! Out of my six core runners two completed their first half marathon. Three others were able to get their best half marathon time and the sixth, Pittsburgh, was able to watch his girlfriend complete her first half….. And we all able to come in under the goal. We are all going to finish… Together. I thought it was train together, race alone. 😉 I loved it.